I was looking for a 9N, so I would have one of each (9N, 2N, 8N). That was the original plan. 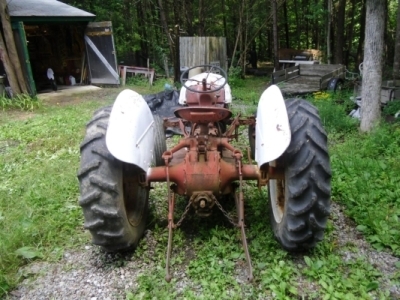 This tractor was advertised as a 2N, but I could see a proofmeter, late 8N shift knob, and side distributor engine in the photos. 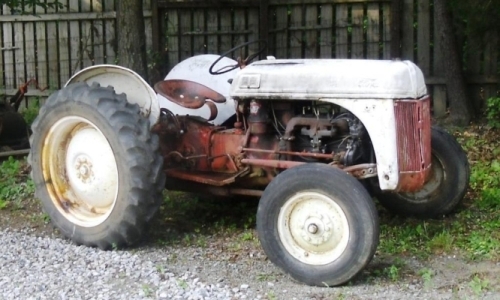 It was obvious to me this was really a late 8N Tractor. The ad wasn't generating a lot of interest, so I decided to keep an eye on it. Apparently two other people had the same idea and threw last-minute low bids. It was close, this time I guessed right, and the others bid just a little too low. Sorry about the image quality for these shots. This is how it sat on the lot when I picked it up. 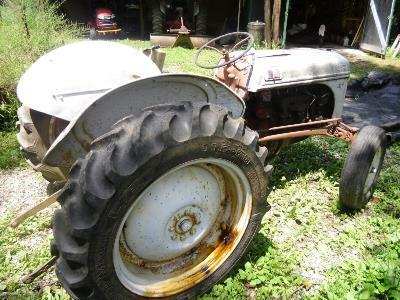 This tractor looks no better than the others, and it's the first one that wasn't running when I bought it. Getting a tractor home from across town was looking like another adventure in the making. I don't own a truck or vehicle trailer, but do have a decent set of ramps. Rental prices are always all over the place, but regular moving vans are usually the best deal. The hope is that the tractor will actually start, and drive up the ramps. The backup plan is that it will have to be winched up the ramps and into the truck. Picked up the truck and went by the house to load ramps, winch, battery, compressor, tarp, chains, straps, etc. The tractor actually looked better live than in photos. 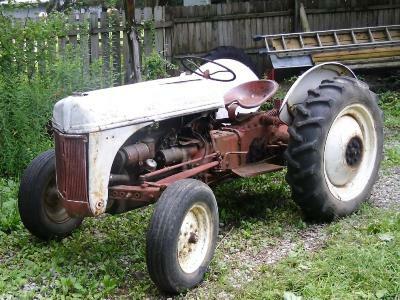 The engine isn't locked up, the 6-volt battery in the tractor is still good, it even cranks, but won't start. Got fire, but no bang. Tried a few tricks but called it quits when a steady stream of gas started running out the carb. Turn gas off. Go to plan "B". There was a convenient hill. Moved the truck, set up ramps, got the tractor rolling, and almost drove it right in. Had to winch the last few feet up the ramps. Spread the tarp so the truck floor would stay clean. Used more straps and rope than necessary to secure the tractor, and headed home. We were a few miles down the road before it occurred to me that the "adventure" had mostly fizzled. Unloading at home wasn't any problem, and returned the truck several hours early. —Bent Grill (does anybody ever get a straight one?). —Hood badly messed-up around radiator neck and nose. —Radiator is a cheap replacement type (does not fit). —Fuel line (route to carb appears random). —Both Radius Rods are Slightly Bent. —One loop rim rotten, but original hat rim is good. —Leveling Box and solid lift link are both bent. —Rear tires/rims are mis-matched size and offset. —Tool Box full of rusty bolts chewed pecans and mouse droppings. The good news is the battery holds a charge and the engine cranks over easy. Front rims/tires are 15". These tractors came with 19" or 16" rims. Tire selection for those sizes is very limited. This is another good set of 15" rims welded to tractor centers. I sold the last set of these I had. WOW, never would have believed a year would pass before I got back to this web page. My apologies to anyone who was expecting another speedy step-by-step tractor rebuild, it just ain't happening this time. The engine has little or no compression, so it needs to be torn down and rebuilt. 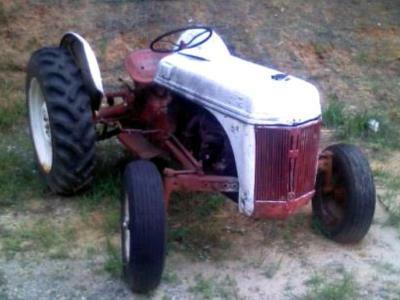 That put this tractor project on hold. 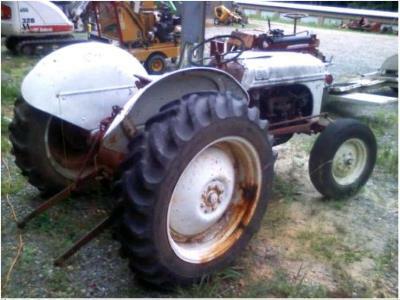 Engine rebuilds can easily cost more than one of these tractors is worth. If everything else was in great shape, it might make sense to rebuild the engine. 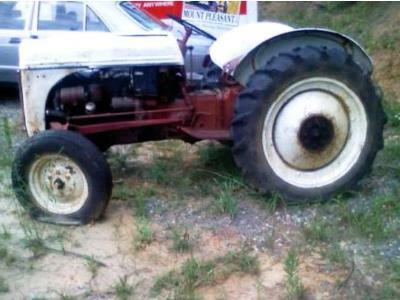 This tractor needs a lot of work just about everywhere, and I already have two good working tractors. Interesting, it seems there may be a few Flathead V8 engines available nearby. That idea has rekindled my interest in this project. Always wanted to combine some of the best ideas I've seen and do my own Flathead V8-8N conversion. 4 CYLINDER ENGINE TEARDOWN: The cylinder head came off easy, and looks good. Then, all cylinders miked out round and look good. There are no score marks from broken rings, just a little corrosion at the top of one sleeve where that piston was parked for a long time. The valves on three cylinders are still sticking open as the engine is turned over. It's pretty obvious why this engine would not start for the previous owner. Penetrating oil, a rubber hammer, and a short session of "whack-a-valve" got the valves going up and down again. This engine might run now, but the right thing to do is pull all the valve assemblies, thoroughly clean them, and make sure the valve seats are done right. This engine does not appear to have any terminal problems. My current engine stand is a bit light for a V8 so there is no reason not to go ahead and pull this 4 cylinder and put it on the stand. UPDATE DEC 2013–Still waiting for the V8 engine to magically appear. Disassembly of the tractor is progressing very slowly with no V8 engine to be excited about. 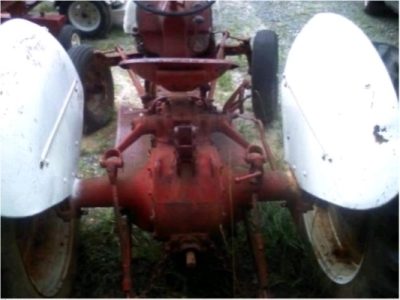 UPDATE July 2014–The tractor is split. Next the transmission comes off. 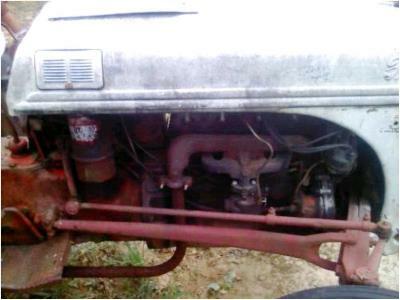 The intent is to rebuild the transmission and rear axle if necessary. To my knowledge, there are no problems in there. The only reason to disassemble them is to make sure they are in good shape for the extra power a V8 engine will have.